One would assume that a guest house called "Fiddler's Inn" is owned by....well, a fiddler. 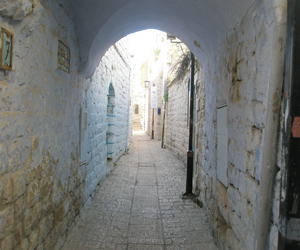 However, Tzfat's Fiddler's Inn has a much more interesting story. The Fiddler in question is Yoni Lifshitz, the lead violinist in the well-known Simply Tsfat band. This band has been engaging audiences throughout the world for many years with their uplifting Hassidic music. Simply Tsfat plays with their heart, hoping to spread the joy and inspiration of Breslev Hassidism and inspire their listeners to explore Jewish spirituality and the Breslev message to be joyful and thankful. As their band's name suggests, the three musicians of Simply Tsfat are intimately connected with Tzfat, the city which inspires their music. The stories that they tell, the music that they play, and the joy in which they teach is infused with Tzfat's magic. It is therefore fitting that the Lifshitz family should live in Tzfat's Old City, greeting visitors who come to stay in their lovely guest house. The Fiddler's Inn is located in a corner of Tzfat's Old City, in a quiet area in the middle of the Old City's maze of lanes and alleys. The house is a true Old City stone house, but it has been newly renovated and decorated. It is comprised of 2 rooms with tiled floors, and has space to comfortably sleep 4-5 people. The kitchen is fully equipped with a full meat and milk kitchen, allowing visitors to come for several days at a time and take care of all their cooking needs right in the apartment. A refrigerator, microwave, toaster oven, and stovetop allow visitors to make themselves at home, which is made even easier by the close proximity of a large supermarket. All amenities for Shabbat are also provided, including a hot plate and hot water urn. The unit is fully furnished - the bathroom even has a Jacuzzi! Wireless internet and air conditioning complete the setting for the comfort of guests. One unique aspect of the inn is the fact that there is parking nearby, and the guest room is accessible directly from the street - there are no steps. Both of these points are quite unusual for the Old City, where stairs and long treks to the parking area are taken for granted. The unit is located within easy walking distance of all Old City religious and historical sites, as well as nearby synagogues for daily and Shabbat prayers.